Atelier Tracy K.: Do you Crochet? Hello World! I have a confession to make. I am a craft supply hoarder. My yarn and fabric in particular have taken over my home. This holiday season I am challenging myself, and you too, to create holiday gifts using only what you have on hand. No buying new supplies. For me this will be a bit of a challenge because I tend to want the "perfect" fabric or yarn for each project. That's how I got here ha ha. It's just over half finished now and will be big enough to cover a double bed when it's finished. Perfect for cuddling under alone or with her future kids or hubby. I am considering writing a pattern for it but really it's a very simple blanket. 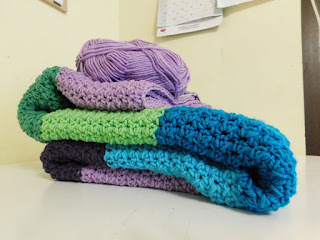 Also, I am going to do a roundup of teen friendly free crochet projects for the holidays. Maybe if that goes well or if I am feeling good about the post I will do some more round up posts. Ideas are appreciated. What are you working on for the holiday season? Hey Tracy, I see that you haven't posted in a while. Just wanted to see if you are okay. Let us crafter's know. Your blanket looks beautiful. I'm sure your daughter is going to love it. Hang in there, it get's easier the longer you're at it. I've been crocheting for years, made afghans for the whole family and many friends. Of course, I stick to the easy patterns now that I am older. It's a lot of fun. Enjoy. Hugs, Edna B.